When asking Fire Protection Associations (FPA), the Fire Brigade, Working on Fire, landowners and others stakeholders about their highlights of the previous summer fire season, the reaction was often “it was such a quiet season” and “we didn’t really have any big fires”. This can be attributed to a wetter than usual spring and summer, the success of the Provincial Disaster Management’s first hour Initial Attack with aerial resources, and increased collaboration among different agencies and landowners under the Incident Command System (read more about ICS in our next edition). Even though it was a quiet season, there are still some highlights to report. November 2013 saw the arrival of the first Air Tractor 802-F in South Africa. The AT-802 is the first aircraft built exclusively for firefighting, carrying a water load of 3100l, which can be delivered with extreme accuracy. 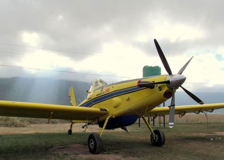 The Western Cape was the proud host of two of these bomber planes for the fire season, and a third has just arrived in the country. The Greater Cederberg FPA was challenged with a mega-fire that broke out on the Nieuwoudtville plateau in November. A cross-border agreement between the Western Cape Provincial Disaster Management, Working on Fire and the Northern Cape Province assured that aerial support was dispatched along with ground teams to offer their support in bringing the fire under control. The Cape Winelands District Fire Work Group identified a list of 24 hot spots and eco-sensitive areas as top priority for firefighting. This pre-planning was put to action in a number of fires with a high success rate, with only two major fires occurring on 26 December and 5 February on Simonsberg Mountain, where damage was caused mainly to pine plantations. The Cape Peninsula FPA’s most notable wildfire of the season occurred towards the end of December 2013 in the Steenbras Catchment Area, where the fire continued to stand up for several consecutive days. The Overberg’s previous fire season could more fondly be described as a flood season after the occurrence of two big floods in November and January, and with only a small number of wildfires. Summer in the Southern Cape forms just a part of their year round fire season, but can also report of a lower than average wildfire occurrence for the summer.